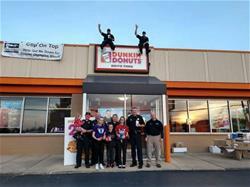 (Montgomery, IL) – The Montgomery Police Department partnered with both local Dunkin Donuts in Montgomery to raise money and awareness for the Special Olympics of Illinois. On Friday, May 18th, 2018 between the hours of 5 am and Noon, motorists were able to drive past both locations and see police officers up on the rooftop waving at them. The teamwork of the Village of Montgomery Police Officers, employees, and friends and family helped to collect a total of $4, 393.78 to benefit the Special Olympics of Illinois. The Montgomery Police Department continually strives to build community partnerships that foster mutual respect and enhance the quality of life for all. We appreciate our ability to help contribute with Dunkin Donuts to this great cause.